♋Ideal for a wide range of hands-on learning projects and sculpting activities. ♋Perfect way to understand kids' inner world by kneading mud. ♋Help Kids to learn the color, shape and structure while playing. ♋Keep your kids away from electronics, this can help them develop their creativity and imagination while play based learning. ◆ 1.CHOKING HAZARD -- Small parts. Not for children under 3 yrs. ◆ 2. While working with raw polymer clay, DO NOT rub your eyes. Wash your hands before eating. ❖ If you receive the goods have any flaws or missing clay, please contact us, we will offer you a satisfied solution, please do not stay bad reviews, which has a great impact on our products. ☺ The 24 Colors Modeling Clay Kit , all in good quality. Trust me, you will not regret to choose us. 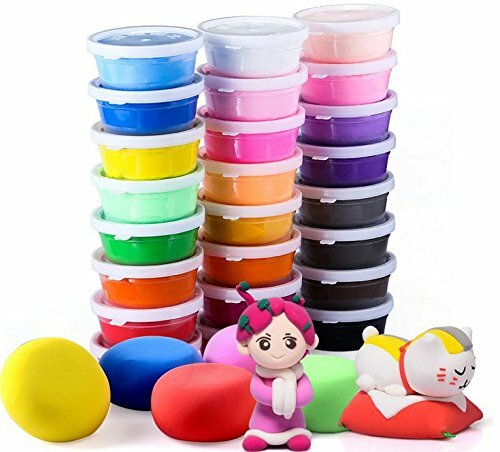 ✌Unleash your Little One Creativity: 24 Colors Molding Clay Set (0.7 OZ each Colors, 16.8OZ in Total ) Including Project Booklet in English. ✌Extremely Soft and Flexible: Air Dry Clay is extremely Soft and Flexible, Easy for Kids to Shape, Air dries completely in 24 hours. No Need Baking. ✌Shape and Once Cool can be Sanded, Drilled, Magic Clay Takes 24 Hours to Fully Harden. Perfect for Jewelry, Home Decor, Mixed Media, Seasonal Items and More. ✌Intelligence Development: Keep kids occupied with Our Magic Clay and Stay Away from Electronics, It is Great for Sensory Development Increase Operation Ability Enhanced Creativity, Play-Based Learning ! ✌Eco-Friendly Material: All of our Material are Non-Toxic and Eco-Friendly, Comply to CE, ASTM D-4236, Harmless to human and Environment. If you have any questions about this product by iFergoo, contact us by completing and submitting the form below. If you are looking for a specif part number, please include it with your message.